that evoke memories of a quieter, less chaotic time. Madelyn McMillan-Wise , a fine-art photographer, went back to school at 59 to get her degree in photography. 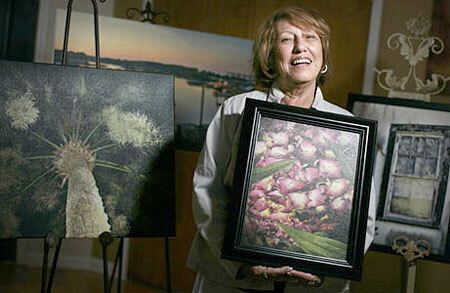 Her images are mostly of Florida and are printed on canvas. NEW PORT RICHEY – Madelyn McMillan Wise came to Tarpon Springs as a young girl in 1949, and in her heart never left west-central Florida. Now she’s back, camera in hand, trolling traffic-logged U.S. 19 hunting for images of the Florida that once was. Most of her images, printed on canvas, look more like oil paintings than photos; they are dreamlike and spiritual, evoking her own vision of memory and longing. A shaggy palm tree at night becomes nature’s sculpture; mossy pilings beneath a pier turn to abstraction; a wooden cross erected by net fishermen becomes a forgotten political statement. While driving over a bridge near the Crab Shack, she spotted an elegant old heat-cracked window of an abandoned building; she found the derelict antique yacht in a lushly overgrown lot near the oldest house in New Port Richey; she found the perfect warm twilight settling in over fishing boats in Cedar Key while lingering one day and not doing much of anything. At 62, McMillian-Wise arrived at photography the long way, after working several careers and raising a family. She’s sold insurance and owned a pub and general store in Fowler’s Bluff along the Suwannee River where she lived for more than a decade. 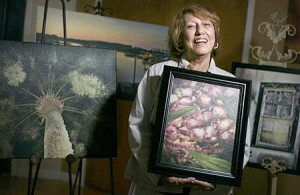 A few years ago, she enrolled at Sante Fe Community College in Gainesville after learning it had a good art department. In May, McMillian-Wise, who was caring for her ailing father the whole time she was at Sante Fe, finally received her associate’s degree in fine arts, something she treasures. “It was a wonderful program, I took many more courses than what I needed, but I thoroughly enjoyed it,” says McMillian-Wise who previously had only one semester of college under her belt. Petite, soft-spoken, with auburn hair and dark eyes, she goes barefoot on a hot summer day and wears a colorful necklace made of coin-sized discs of beach glass strung on rawhide. She’s a masterful Greek cook who can whip out spanakopita and baklava for the weekly Sunday family dinners she shares with her daughter, Suzanna Cummins, a paramedic for Morton Plant North Bay, and son-in-law, Tim Fussell, retired Port Richey fire chief. Right now she lives in a trailer next door, on a pie shaped lot she recently purchased and has plans for a manufactured home. The property overlooks a dog-leg of Bass Lake, a view that is stunning in its ancient Florida feel. Ringed by cypress trees and framed by swags of moss, the view, she says, is more beautiful than the one she knew on the Suwannee River. “See, there are still some nice places away from the crowd in Pasco County,” she says. She moved to New Port Richey in January to be closer to her children and grandchildren. She’s also not far from the place she grew up. Tarpon Springs has changed a lot visually since her childhood. “I was back recently, it felt different to me, more congested,” she said. Pasco County is the place she plans to permanently call home. She’s a member of the West Pasco Art Guild and her work hangs in the Capital City Bank in New Port Richey. She travels the art show circuit with her work during the winter “I love the people!” and sells her photos on her Web site: www.arttreasuresbym.com. She’s printing them on canvas in a gallery-wrap style that brings the color around the sides so that they can be hung on a wall without a frame. Many of her photos depict “the rustic old Florida” that, although hard to find these days, she still finds interesting enough to shoot. Elizabeth Bettendorf can be reached at ebettendorf@hotmail.com. Read Online Article at TampaBay.com! I strive to evoke memories, challenge the senses, and heighten the pleasure of the viewer. All photograpy, designs, and contents are copyrighted by Madelyn McMillan-Wise. Use without permission is strictly prohibited. This site is a Phycel Designs Custom Creation and Hosted by DreamHost.